Gently fold in the crab and mix until lightly blended, taking care not to break up lumps of crabmeat. Cover and chill until mixture is firm. In a large stock pot set over high heat, fill with water and let come to a boil. Once boiling, add the lobster tails and cook for 2-3 minutes. Remove from pot and place in a bowl of ice water to stop cooking. Remove from ice water and dry off with paper towels. Set lobster onto a cutting board and cut down the middle lengthwise. Carefully pull back the shell and remove tail meat as one piece. Fill the now empty tail shell with crab stuffing. 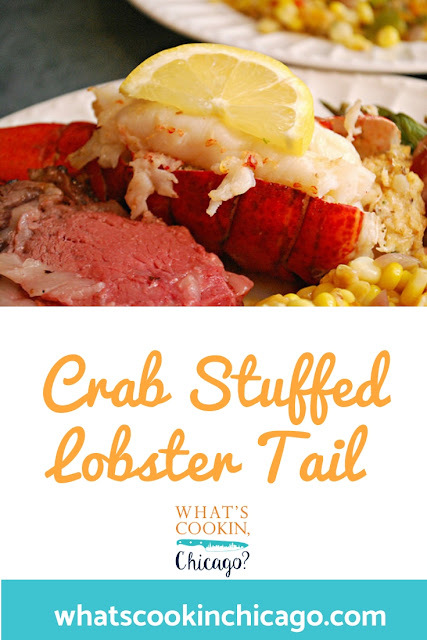 Top the stuffed lobster tail with the tail meat, laid on top. 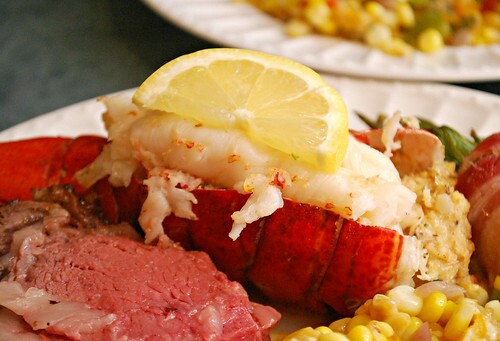 Place stuffed lobster tails onto a baking sheet and bake in the preheated oven for 10-12 minutes. Remove from oven and brush with garlic butter sauce. Garnish with lemon slices and chopped parsley before serving.